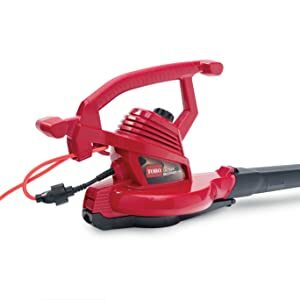 Swapping weight and gas cost for an easily manageable wire is the USP claim of virtually every electric corded blower/vac out there, but few manage to truly replace the gas behemoths. For one, the blowing power needs to match the gas guzzlers of yore. For another, the weight of a good many units is beyond the capacity of the average pair of arms. Toro of course, has solved these problems in higher price brackets. At the Toro 51619 Ultra Blower Vac’s price point though, cost-cutting can easily lead a brand astray. What we do find though is that the claims of efficient blowing/fine mulching, low overall weight and usage convenience are proved by testing for the most part. It has its mulching limitations though, as we shall see in the detailed review below. Weighing in at just around 8.5lbs, this Toro Ultra could be handled by seniors as old as 71 without literally breaking a sweat. Even younger veterans of large lawns noted that the lack of bulk and simple operating procedure made fall cleanups a breeze. We can add from experience that the unit’s multiple holding options ensure that no matter where you are blowing/mulching and for how long, your arms never get that numb feeling. As you’d expect of any blower pumping out 250 mph of leaf-blasting winds, the Ultra manages to handle wet leaves, twigs and material stuck in the undergrowth with commensurate ease. Coming to the vac and mulcher though, we find that the multi-purpose motor does an equally fine job. Moderately heavy leaves and medium-sized twigs are eaten up and bits spat out without the unit facing any hiccups. To be honest, larger twigs aren’t blocked from entry and can occasionally cause the unit to whine and slow down as it digests the morsel. During testing though, such incidents were rare and when they did occur, the machine chugged along before resuming its expected speeds. Last but not least, reduction of debris is impressive. While we could not verify whether the 90%+ reductions were actually true, we did notice that what required packs of bags earlier, could not be accommodated in as little as 3-5 bags. With others concurring in this reduction ratio, we daresay that even the larger yards will see a significant fall in the debris cleanup costs and time. The blower/vac comes with excellent speed controls accessible through a simple but durable dial. More than the dial though, it is the quick release latch that users found useful, since it transitions the unit between its blower, vac and mulcher forms. 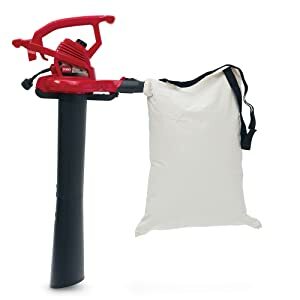 Since both are easily accessible without straining the arms, shifting from one to another is hardly the convoluted task it was in the heyday of the gas leaf blower. While these may not be at the top of your criteria for a blower/vac, it needs to be mentioned that Toro’s offerings here are especially useful. For one, a wide range of cords are compatible, though veterans suggest at least a 12ga cord for cords over 100ft, with 10ga being preferable. Whatever cord you choose, the unit has a cord lock mechanism that keeps the cord from becoming an unwieldy tail to your garden beast. That said, it should be noted that at some angles the cord holder can be a bit slippery. Interestingly, the dump bag has also been “updated” to include a bottom zipper that keeps the handles from getting dressed in debris. Cord control and bags are easily operated for hassle-free operation. Intake draws in large twigs that slow down the unit. Cord holder can be a little unwieldy at some angles. You may also want to read our guide to the best electric leaf vacuum mulcher blower or our other product guides.